“Wow” – say most people when I tell them that my 6 month old baby has already cut 5 teeth. “That’s great”. Mmmmm – yes it’s good that we are getting them out of the way, but he’s so young to be going through constant pain, as well as his developmental milestones which are currently coming thick and fast! The one thing I hadn’t thought about was how I was going to care for his teeth, especially now we have started introducing solids. That’s where the brilliant Brush-baby team have come to my rescue. A few months ago I started using the teething wipes, as they were easy for me to put onto my finger and wipe over his gums and emerging teeth. It seemed to give him relief too and he loved the flavour. But, as more teeth started to appear, and they became bigger, I needed a plan B as all he wanted to do was bite – Ouch! 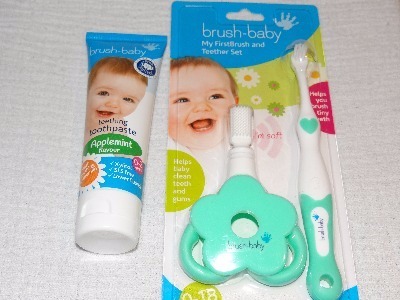 I contacted the Brush-baby team for some advice, and they kindly sent me the My FirstBrush and Teether set, and some Applemint teething toothpaste to try. And, I’m pleased to say, our brushing journey has started! The teether set has been brilliant for use during the day, as the little man loves nothing more than chomping on it. It is really easy for babies to hold, and the flower guard on it also makes sure that he can’t put too much of it into his mouth which is great. He also uses this to bite on when he wants a harder surface.What I love about this teether is that it helps to keep his teeth clean during the day with the soft silicone bristles, and that he can do it himself! When his teething pain has been really bad, I have popped it into the fridge for a few hours, and found that it gives him much better relief. We have also used it to apply teething gel, which is really useful, as he can be quite resistant when i’m trying to apply it for him. Teething tantrums galore! Sound familiar? The toothbrush and toothpaste has been incorporated into our daily bath time routine. He now knows to open his mouth so mummy can brush his top and bottom teeth. The bristles are so soft that I’m not worried about hurting his gums, and routinely try to make sure that I am gently brushing his back gums – especially now that he has started on solids. The toothpaste is infused with chamomile which means that it provides a natural anti-inflammatory effect, which is great for any more emerging teeth. He seems to really like the applemint flavour of the toothpaste, so the whole process is made that little bit easier for me. So there we go, it’s easy! I would 100% recommend the Brush-baby products to all parents whose babies are getting their first teeth – and my favourite all rounder has to be the teether – it’s great!